Extra! Extra! Dateline: Lovecraft coming soon! Dateline: Lovecraft is one of the projects we vaguely mentioned a few months ago as something Cthulhu Reborn was actively developing. Since then, there has been a lot of frenzied activities on a number of fronts that has brought this particular project much closer to being a reality. With that in mind, I thought it might be worth sharing a little bit more information about what this product will be, and when it might materialise. 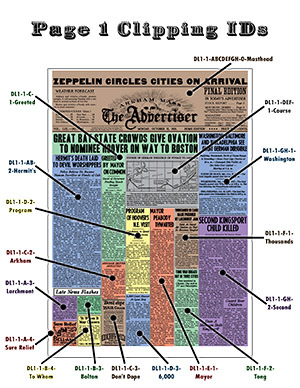 The main concept behind Dateline: Lovecraft is to create a large in-world prop document — in the form of a 1920s newspaper — that can be used as a source of inspiration for any number of Lovecraftian game scenarios. It is entirely system-agnostic: gamers who like their Lovecraft RPGs with a Trail of Cthulhu flavour could use it, as could Cthulhu Hack folks, or even people who play any of the 7 editions of the “world’s most venerable tabletop Cthulhu RPG”. The core of the product is a 12-page broadsheet newspaper, an entire front-page-to-back-page copy of the Arkham Advertiser for Monday 15 October, 1928. Now, 12 pages might not sound like a lot … but 1920s broadsheet pages are big (about 23 inches wide by 33 inches tall) and very, very text-heavy. So, by our count the full collection of articles, general columns, advertisements, and miscellaneous weird stuff adds up to about 40,000 words of text. Inside the 12-page newspaper, you will find all manner of things — ranging from mundane world news (sometimes with a hidden twist), local Miskatonic Valley news, editorials, display advertisements, letters to the editor and its resident “agony aunt”. You’ll also find columns for motoring enthusiasts, radio owners, puzzle fans, a stereotypical 1920’s “page for women”, a sports page, and a magazine page. Finally, you’ll also find a full page of classified “want ads” covering everything from the mundane to the inexplicable and bizarre. 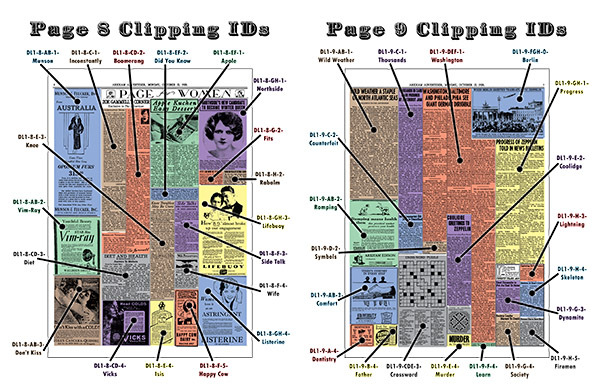 Scaled-down versions of several parts of the newspaper prop are scattered through this post, with colour overlays to highlight the different columns, advertisements, and articles. 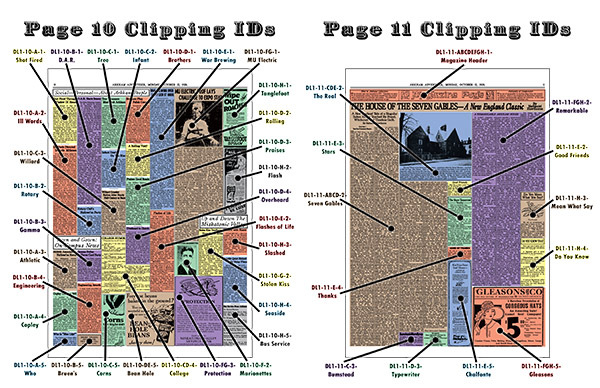 While the newspaper prop is the centrepiece of Dateline: Lovecraft, the kit also feature a companion PDF which contains some helpful indices, suggestions, and advice on ways to use it to enhance Lovecraftian tabletop RPGs. Because of the massive amount of diverse text to be found spread across the 200+ articles, columns, and advertisements, finding specific references to people, places, addresses, and telephone numbers can be a challenge. To assist, the companion PDF includes separate indices covering each of these — that way if you want to quickly track down all the newspaper content that mentions Arkham Mayor John Peabody, you can simply look him up in the index of people and quickly track down each such mention (for the record, he turns up four times). Similarly, if you want to quickly determine every newspaper mention of the Miskatonic Valley Savings Bank or the MU Department of Classical Languages, those appear in the index of Arkham businesses and institutions. Finally, if you want to see all the French Hill addresses mentioned somewhere in the paper, or see all telephone numbers listed, you can track them down quickly in the address index and telephone index respectively. In addition to just making the newspaper prop easier to navigate, the companion PDF will include some ideas for how to leverage the wealth of mundane and weird information contained in its pages to inspire or augment Lovecraft-like game scenarios. While the “old faithful” scenario starter of “investigators notice news of a strange local murder” is an obvious option, have you ever considered hiding a key scenario clue inside a classified advertisement, or in a display advertisement for a new Arkham local brand of cigarettes? How about kicking off a scenario by having the investigators find a suspicious corpse with an apparently ordinary newspaper clutched in its hand, with odd pen scratchings calling attention to an unremarkable story about the local Varsity football team? 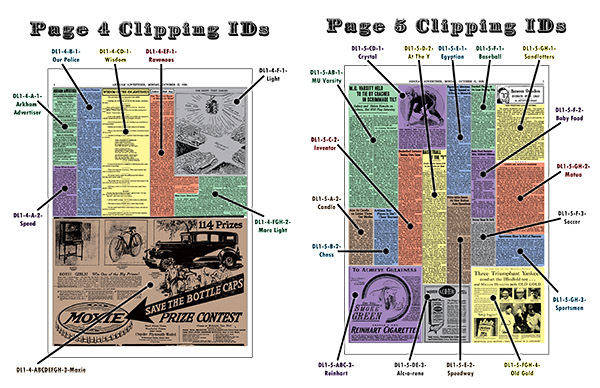 With a bit of creativity, there’s quite a variety of ways to use newspaper content in a mystery-based game. Right now we have a fully completed design for the 12-page newspaper, and have a team of hard-working proof-readers combing it for typos and other errors. The various indices have been compiled, and are ready to go into the companion PDF. We’re still writing some of the smaller pieces of suggestions for methods for exploiting the news for game enlivenment. And we are still considering writing a short scenario seed to go into the companion PDF as a more concrete example of one method of weaving a tale out of the diverse elements in the paper. All this means … we’re not all that far away from having something that we can release as a digital product. I would like for Dateline: Lovecraft to be available for sale before the end of August (although we also have a Convicts & Cthulhu PDF to release this month). Several people have contacted us to point out that this would be one product that would be extremely cool to have as a physical print item. We definitely agree, and once the digital product is out we will start looking into the possibility of getting copies printed as large vintage-style newspapers. This isn’t as easy as just putting something up as a Print on Demand title; printers who can produce large format newspapers on authentic newsprint are much rarer, and usually cater for very large-volume print runs … but we have a few good leads on printers who might be able to create something like this for us. If you have any suggestions, feel free to get in touch (via the contact form on our About page). This entry was posted on Tuesday, August 7th, 2018 at 9:04 am	and posted in Dateline: Lovecraft, News & Updates. You can follow any responses to this entry through the RSS 2.0 feed. I might find this even more useful if I could modify the entries. Keep the framework and layout and typefaces, but let me change a date, or a name, or a street address. Or even replace one article by typing in my own text. That kit is 100% editable templates for newspaper articles and has the same look and feel we are going for in Dateline: Lovecraft. For this new product, though, part of the point of the product will be providing a set of fixed articles and other content, since if sales are good enough we would like to commission writers to create some free add-on scenarios that riff on specific items in the newspaper prop, expanding them out into scenario sketches or similar. I do agree that the idea of customizing things to your group is awesome, though. Hopefully the combination of the older PDF toolkit and the new product will allow for someone to mix & match to largely achieve that result. I had been unaware of Mutable Deceptions, and just purchased it. It looks handy, but since it just makes single articles as handouts it’s not quite as cool as I’d hoped. Nevertheless, it’s handy to have. I hope at some point you’ll have a full-page newspaper that’s writeable. But good luck with Dateline: Lovercraft. You’re not the only person who has suggested such a thing, so it’s definitely something we will look at as a potential future project. In the meantime, we hope you get some good use out of Mutable Deceptions and consider picking up Dateline: Lovecraft when it comes out.